The Tastiest Minor League Baseball Mascots | Good. Food. Stories. 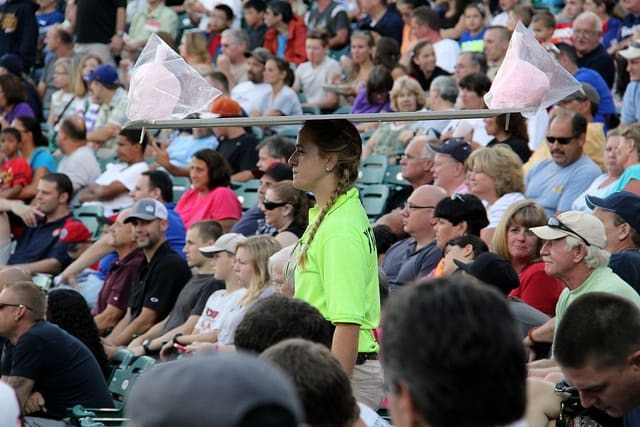 There are two reasons people go to minor league baseball games. The die-hard fans are there to see the stars of tomorrow, the prospects making their way up the ladder of the farm system toward the Major Leagues. Everyone else is there for the food. This is true in our household, too. When Casey and I take in a game at one of New Jersey’s minor league ballparks, I have an interest in the players on the field and often dedicate a few innings to taking pictures of certain notable guys. But before going to our seats, we both turn our gaze toward the concession signs and menus to contemplate what we’ll treat ourselves to that day. Food is such a draw at minor league fields across the country that earlier this year MiLB.com, the official site of Minor League Baseball, conducted an elaborate showdown of 72 menu concoctions to produce one winner. But the lure of foodstuffs isn’t limited to the concession stands and concourse kiosks. A handful of ballclubs’ names are related to food, and many others have food mascots that get a minute under the floodlights each night. Six years ago, I categorized the nicknames of all 160 minor league teams, just to see how it all broke down. Rebranding and relocation have changed a few clubs’ identities, so the numbers are no longer exact, but I suspect the percentages are still pretty close. Now there are four teams I would categorize as being named after food. Iowa’s second-largest city has been a part of the minor league scene since the 1890s, mostly with banal nicknames like Braves, Indians, Rockets, and Raiders (though with a few stretches before 1933 as the Canaries, the Rabbits, and the Bunnies) or the names of its Major League parent clubs: Cardinals, Astros, Giants, and Reds. But in 1993, the franchise embraced its place within America’s top corn-producing state (I bet you thought it was Nebraska) and adopted an a-maize-ing moniker. The Kernels come to life with their mascot, a baseball-headed “human” with a slack tongue that gives him a permanent derp-y look. Mr. Shucks has yellow arms and blue legs extending from a green husk—with petals (? Leaves? Strands?) folded down over his shoulders. He completes the ensemble with a Kernels jersey and cap. When Oregon’s fifth-largest city welcomed a franchise in 2013, the Portland suburb drew its nickname from the Pacific Northwest’s reputation for producing top-notch craft beers. Ironically, the franchise moved from Yakima, Washington, America’s largest hop-producing state, to the No. 2 state on that list. After 50 years of being known as the Reds, Colts, and A’s, this franchise in movie mogul George Lucas’ hometown acknowledged the region’s agricultural acumen with a rebranding in 2005. With production of almonds and walnuts, particularly, in the area, the club’s new identity pays homage to those tree fruits that cause allergic reactions in me and many others. Something tells me this team doesn’t do peanut-free nights. Two different cartoon logo nuts grace the caps worn by the players, and three mascots roam the grounds and the community: Al the Almond, Shelley the Pistachio and Wally the Walnut. I’m breaking out in hives just thinking about them. This may be the team that started this whole study into the origins of minor league nicknames. In 2004, the Orlando Rays moved to Alabama’s capital and embraced Southern cuisine by adopting a fluffy, buttery identity. The Montgomery Biscuits are everything minor league baseball and minor league mascots are these days: fun, playful, and unique. No other professional (or collegiate) team was known as the Biscuits, allowing the club to trademark the name and bring in revenue from licensing. Monty’s not alone in representing the Biscuits. They’ve also got Big Mo, “Montgomery’s Biscuit Lovin’ Beast,” according to the team’s website, and a live potbellied pig known as Miss Gravy, Duchess of Pork. Animals are the most popular form of nickname in the bush leagues, but most are of the fierce, cuddly, or avian varieties. But the Charlotte Stone Crabs in Florida and the Lakewood BlueClaws on the Jersey Shore could fall under the food mascot umbrella. 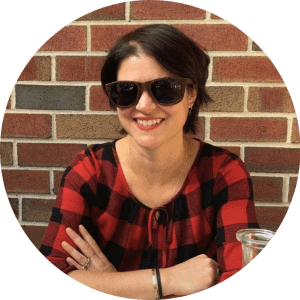 There are also the Biloxi Shuckers, who exalt oyster harvesting in the Gulf of Mexico, and the Helena Brewers, who, yes, take their name from their parent club in Milwaukee, but still manage to honor those noble souls who make our beer. The Fort Wayne TinCaps tip the, um, cap to local legend Johnny Appleseed with a logo of a menacing apple donning a tin-pan toque. Johnny, the TinCaps’ mascot, just seems like a member of Matthew McConaughey’s front-porch jam band. And finally, the Fresno Grizzlies become much less threatening on the 10 Taco Tuesdays during which they become the Fresno Tacos, complete with special jerseys and caps. Many of the other minor league franchises that went in another direction with their team nicknames still get in on the foodie fun, either as a tie-in to a regional favorite or a straight-up sponsorship deal. 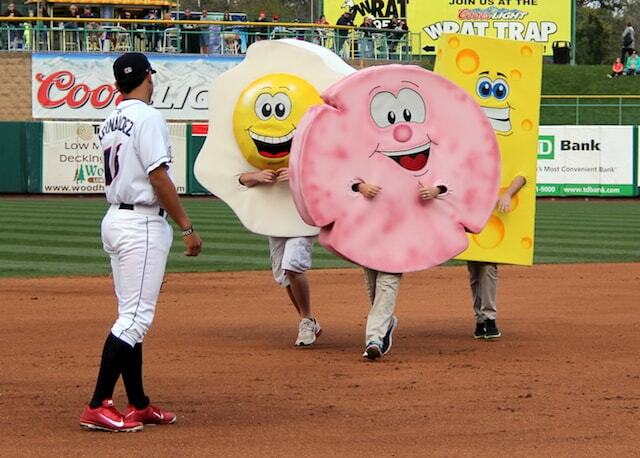 Whatever the impetus, these food-related appearances usually manifest themselves as mascot races between innings. We first became aware of this phenomenon when the BlueClaws began their Great Eyeball Race, sponsored by a local optometrist. Three team employees (or interns) donned giant inflatable eyeballs, with only their legs protruding, and raced from a gate in the right-field corner to a finish line near third base. A few years ago, the BlueClaws added my dad’s favorite breakfast to the lineup with the Pork Roll, Egg, and Cheese Race. It’s the same as the Eyeball Race, but with different costumes. Albuquerque Isotopes: The Chili Pepper Race, featuring Red Chili, Green Chili, Taco, and Salsa. This one can get heated. Altoona Curve: The Great American Bagel Race among Blueberry Bob, Asiago Allie, and Cinnamon Crunch Cindy. Do they just run in circles? Boise Hawks: The Great Potato Race pits Gem, Spud, and Fry in a contest that, in my mind, has no losers. Buffalo Bisons: The W.C.C. : Wing, Cheese, Celery Race. It gets spicy when Atomic joins the fun. Iowa Cubs: Midwestern marketplace Kum & Go used to sponsor the Kum & Go, Go, Go Race, featuring a hot dog, a bag of chips, and a cup of soda. But now they hold B-Bop’s Burger Race. Lehigh Valley IronPigs: Though named for pig iron—an element in the steel manufacturing process—the club doesn’t dismiss porcine tie-ins. For Saturday home games, the players wear Bacon USA jerseys and caps with strips of bacon across the front. A between-innings race features a pulled-pork sandwich (Barbie Q), a hot dog (Diggity), a slab of bacon (Chris P. Bacon), and a hunk of ham (Hambone). 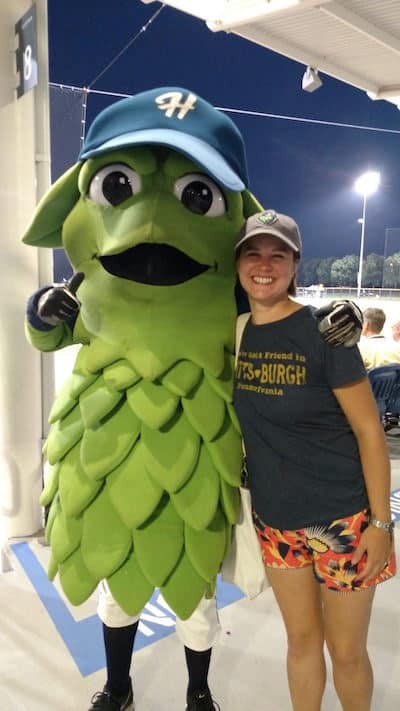 Stockton Ports: It seems the club has done away with the Asparagus Race, but it still celebrates the region’s signature crop with Asparagus Night, featuring jerseys that may or may not have been designed by the Jolly Green Giant. Vancouver Canadiens: The Sushi Race rolls on with Ms. BC Roll, Mr. Kappa Maki, Chef Wasabi, and Sadaharu Soy.